The village is within short walking distance of the berth. 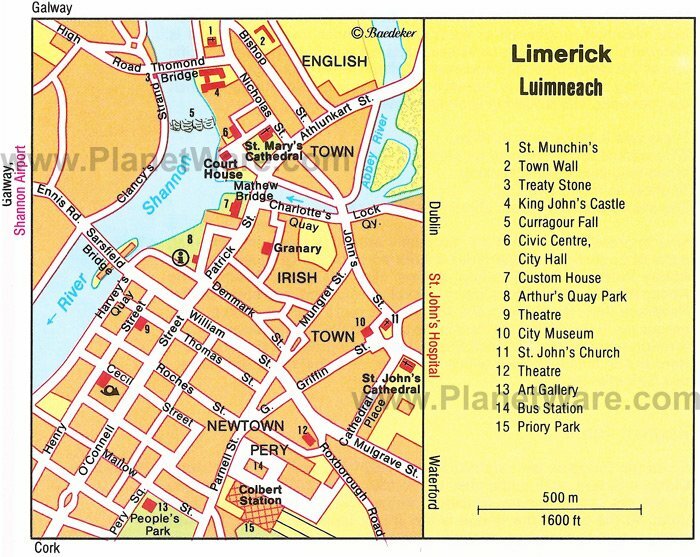 Most visitors head for Limerick 35 km away. The village is within short walking distance of the berth and in addition to the museum there are general shopping and eating facilities. Listowel, a typical Irish market town, with a large variety of shopping and eating experiences, is a short coach trip away. Limerick: The city overlooks the majestic and historic King John's Castle which is perched on its Shannon river bank. A city of many contrasts, it has managed to successfully blend the modern with the historic. It offers many cultural attractions, including cinema, theater, museums, concerts, walking tours, boat rides and a wide variety of sports amenities. The Republic of Ireland is part of the Eurozone, so as in many other European Union countries the currency here is the Euro (symbol: €). Stand Alone Cash machines (ATMs) are widely available in every city and town in the country and credit cards are accepted in 90% of outlets. Fees are not generally charged by Irish ATMs (but beware that your bank may charge a fee). English is spoken everywhere but Irish (Gaeilge) is the first official language. Offices: 9am to 5.30pm, Monday to Friday. Shops: 9am to 6pm Monday to Friday, until 8pm on Thursday; Saturday: 9am to 6pm; Sunday: Limited Hours Pubs: 10.30am to 11.30pm, Monday to Thursday. Closing is at 12.30am Friday and Saturday. On Sunday, 12.30 to 11.30pm. Pubs are closed on Christmas Day and Good Friday.